In this construction video tutorial, you will come to know the definition and types of surveys. Surveying stands for the method of finding out the physical and cultural details as well as the three dimensional positions of points along with the spans and angles among these points which are generally situated on the surface of the earth, but may also be situated over or underneath the surface. Surveys are carried out for the planning of maps, plots, topography, and boundaries to determine the area and volume of a specific plot of land as well as estimate and establish the ownership of land, and utilize in the design, planning, and construction of various types of structure and communication networks. 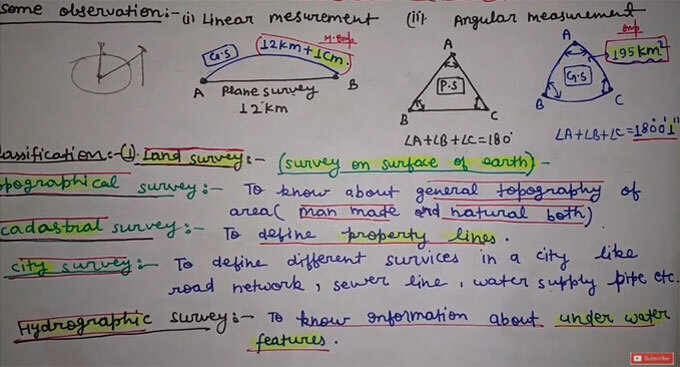 Sound knowledge in geometry, mathematics, and law is essential in the field of surveying. High precision optical and electromechanical equipment together with global positioning data captured from the satellites, is also employed for surveying. A map demonstrates the horizontal projection of the area surveyed and not the real area. But the vertical distance is demonstrated more precisely with drawing sections. Supervise the functioning and health conditions of finished structures and facilities. Plane Survey – In this type of survey, the deflection of earth is not taken into consideration. It is ideal for small area. Under this survey, two plumb lines at two various places on earth surface are parallel to each other. Geodetic Survey – Under this type of survey, the curvature of earth is taken into consideration. It is perfect for enormous area. Under this survey, two plumb lines at two various places on earth surface will meet at centre of earth. To gather more information, watch the following construction video tutorial. Land Survey – Here, survey is performed on surface of earth. Cadastral survey – In this type of survey, various details like boundaries of houses, town, fields and other properties pathways are set. Topographical Survey – It is conducted to gather information on general topography area. Cadastral Survey – It is carried out to describe property lines. City Survey – It is conducted to describe various services in a city like road network, sewer line, water supply pipe. Hydrographic Survey – It is performed to gather information on under water features.